the kitchen, as we inherited it, has very little upper cabinetry. and the larger wall, that is above the sink, has none at all. i'm rather enamored with the idea of open shelving with a pop of color and some woodwork to match the craftsman style of the home. 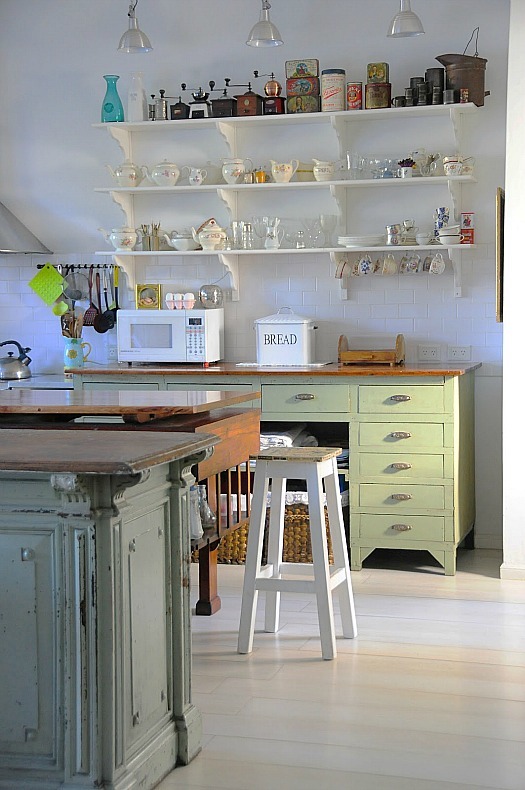 this first picture is exactly what i would want - i love just about everything in this kitchen - but the shelves are what i picture in my head to a T. the beautiful seafoam color, the curvy yet simple corbels. i'm a little concerned though that the shelves may look strange without a window over the sink. obviously, living in earthquake-prone california (plus having lived through the northridge earthquake of 1994) makes open shelving a bad idea in general. so sad, because it's so dang pretty. i would only be able to put non-breakables or fall safe items up there. or find some way of securing it - which would make anything meant to be easy-grab not-so-easy-to-grab. maybe something like the small cubby below with a built-in barrier.